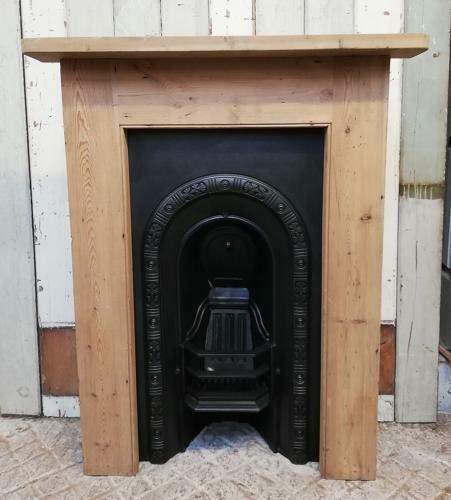 A very pretty Victorian cast iron bedroom fire insert and reclaimed pine surround. The insert has a decorative arched design around the fire opening with leaves and circles, typical of the era. The insert has the original shaped front bars and the grill and smoke flap are present. The concrete fire back has a decorative detail. The iron has been blacked and polished. The insert has been paired with a stripped pine fire surround that has a simple and classic design suitable for both modern and period properties. The surround is ready for finishing by purchaser with perhaps a wax or paint finish to suit. The fire insert has a registered design number, RD41092, dating the fire to 1886. The surround and insert are reclaimed antiques and therefore have some signs of wear and age. There is a thin surface crack along the crossbar of the surround but it does not affect its structural integrity. There are some marks, small holes and chips. The fire insert is in very good condition but there is a small break to the left hand corner of the smoke flap and there is a very small gap between the side of the fire and the concrete fire back. The back has surface rust as expected. The listing price is for the insert and surround but they can be sold separately and individual prices are listed below. Please contact us if you wish to by the insert or surround separately. A very pretty bedroom fire set that has character and charm.